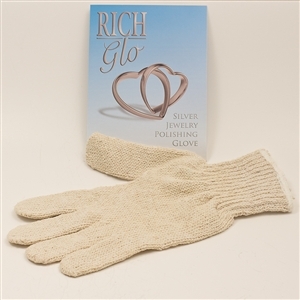 Keep your sterling silver jewelry clean with this polishing glove. Easier to use than a cloth, and safer for your turquoise jewelry than liquids and creams. These cotton blend knitted gloves are impregnated through out with a non-toxic silver polish formula. One size fits all – Fits either hand. Get two! You will have your pieces sparkling clean in no time! Keep your sterling silver jewelry clean with this polishing glove. Easier to use than a cloth, and safer for your turquoise jewelry than liquids and creams.